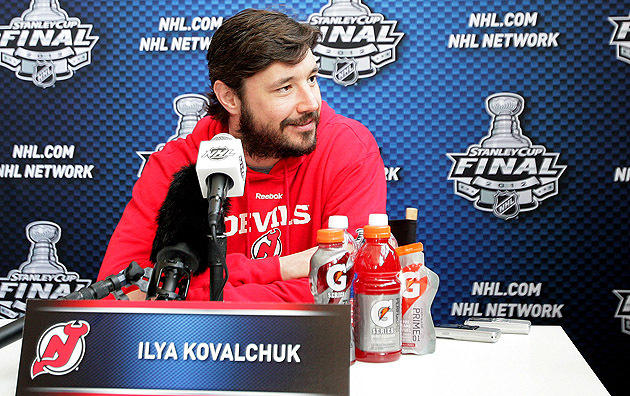 Ilya Kovalchuk didn't feel like a New Jersey Devil. He was the antithesis of so many of the franchise’s hallmarks. He was an offensive dynamo on a team known for its defense. He was an acquired asset, rather than the kind of homegrown player the Devils had used as the backbone of their team. He signed for 15 years and $100 million, on a team where the top end guys took less for the betterment of the roster. Ilya Kovalchuk didn’t want to be a New Jersey Devil. It was July 2010, and the NHL had never seen an unrestricted free agent go to market with Kovalchuk’s skill, stats and relative youth. The problem for Kovalchuk: Only a handful of teams could afford his demands in a capped NHL; and soon it was only the Devils, who traded for him that February from the Atlanta Thrashers (RIP), the Los Angeles Kings and SKA St. Petersburg of the KHL bidding for his services. No one else would pay him. He was a Devil by default, and certainly not a Devil for life. When the Devils signed him to his 15-year, $100-million contract – after that absurd 17-year deal was voided by the NHL – one could see when Kovalchuk would theoretically leave the franchise for the KHL: Either 2018-19 or 2019-20, when his salary tumbled $3 million from the previous year in both seasons. Little did anyone know that schedule would be sped up dramatically: Kovalchuk announced his retirement from the NHL on Thursday, leaving $77 million on the table in favor of the bottomless riches of SKA St. Petersburg of the Kontinental Hockey League. “Remember, this wasn’t a decision by the New Jersey Devils,” stressed team President Lou Lamoriello. It was Lamoriello that made the decision to make Kovalchuk a New Jersey Devil. That’s why he traded four assets – including defenseman Johnny Oduya, now with the Stanley Cup champs in Chicago – for Kovalchuk at the 2010 trade deadline. He appreciated his offense, felt his defense was underrated and saw a leader in Kovalchuk where others didn’t. He just didn’t want Ilya Kovalchuk at a ridiculous cost and term when the winger reached free agency. Devils owner Jeff Vanderbeek pushed to re-sign him; Lamoriello was forced into creative accounting with a massive 17-year contract for the Russian star to make it work under the cap. I asked Lamoriello what he would think if someone brought up Kovalchuk’s contract in the next round of CBA negotiations (in two years) and pointed to it as a flaw. That 17-year contract was eventually voided by the NHL, and replaced with a 15-year, $100-million one. Kovalchuk’s $6.66 million cap hit – the Number of the Beast! – was, in fact, a bargain given his résumé and offensive contributions to the team. Oh, those contributions. He had 31 goals in an otherwise terrible season for the Devils in 2010-11, the year John MacLean made a hash of things at the start. The following year, under Peter DeBoer, the Devils saw Kovalchuk’s full potential: 83 points in 77 games, and then an epic 19-point playoff performance that fueled their unexpected run to the conference championship – before a back injury slowed him in the later rounds. For that postseason, Kovalchuk was something many thought he’d never be: Worth the contract. He showed heart, he showed determination and he showed a will to win. Criticisms and stereotypes surrounding his game melted away. As Zach Parise left for Minnesota and Father Time chased Martin Brodeur, the Devils-As-Team-Kovalchuk felt entirely plausible, going forward. It changed two factors in the Devils’ relationship with Kovalchuk. First off, his contract suddenly sucked. The “cap recapture” clause in the new CBA guaranteed that if Kovalchuk left for the KHL in, say, 2019, the Devils would be penalized with a large sum counting against their cap number even as Kovalchuk played in Russia. During the lockout, he did play in Russia, with SKA, which brings us to the second factor: Kovalchuk’s feelings about the NHL and the KHL. He felt betrayed by the League, on top of his lingering headaches over escrow. Meanwhile, SKA paid him handsomely and the KHL wanted him to be the centerpiece of their league – at any cost. Thoughts of permanently leaving the NHL took hold in Kovalchuk and spread like a cancer. It went into remission during the Devils’ 48-game non-playoff season, but relapsed in the summer, leading to Kovalchuk telling Lamoriello he wanted out. There’s anger, vitriol, confusion, betrayal, embarrassment and confusion among Devils fans in the wake of that decision. Some believe he stole money from the team, leading them to believe in a commitment that wasn’t there. I don’t buy that: I truly believe Kovalchuk made up his mind during the lockout, as he soured on the NHL, was romanced by Russia and, perhaps, saw some disturbing writing on the wall about the Devils’ finances and future on the ice. • $23 million for three seasons, an average of $7.66 million. In fact, the first two years of Kovalchuk’s contract ($6 million apiece) were two of the cheapest in his deal. • Zach Parise. They insulted him, dedicating attention and resources to pursuing Kovalchuk in spite of Parise’s contractual needs. Hell, the very presence of Kovalchuk was insulting: The Devils already had a top line left wing in Parise. Sure, the lure of Minnesota might still have driven Parise to the Wild, but there’s no question that committing to Kovalchuk hastened Parise’s departure. They tried to keep both, but chose one over the other. • A first-round draft pick. Again, the Devils executed the most obvious cap-circumventing contract in NHL history. It read like a parody of one, it was so absurd. The NHL penalized the Devils by taking away a first-round pick of their choosing through 2014. Lamoriello decided that the 29th pick overall pick in 2012 wouldn’t be sacrificed; now, because of the Devils’ hubris in the contract and its punishment, it’s likely going to be a high lottery pick next summer. You can already hear the Flyers fans cackling at the Philadelphia draft. So go ahead and blast Kovalchuk. It's the baffling managerial decisions by the Devils, and their overall commitment to a player that was always going to leave, that's put them in this spot. That said: If I’ve learned anything in over 25 years as a Devils fan, it’s that when weird crap happens, Lou Lamoriello has a funny way of coming out on top. And “Loophole Lou” has his fingerprints all over this departure to Russia. Lamoriello doesn’t care about anything but the success of the Devils – ask Marty Brodeur about the cold calculation behind the Cory Schneider trade. The fact is that the new CBA dramatically changed every GM’s perspective on long-term deals – look at all the buyouts – and Lamoriello is no different. The longer Kovalchuk remained on the payroll before leaving for Russia, the more it would leave in dead cap space for New Jersey. By leaving in Year 4, the Devils have a cap recapture penalty of just $250,000 annually through 2025. That’s not even NHL minimum wage. The Devils didn’t fight Kovalchuk’s departure. They could have prevented him from leaving, or from playing in the KHL through IIHF transfer rules, but they terminated his contract. When the Islanders put up more of a fight to keep Lubomir Visnovsky than the Devils put up for Kovalchuk, there are other factors at play for Lamoriello and the team. Maybe it’s cap savings or actual dollar savings; whatever the case, there was a benefit to the team in the long term. There had better be, because in the short term, this is disaster. Next season, the Devils will miss Kovalchuk dearly, as an offensive engine on the top line and on the penalty kill. The patchwork offense of holdovers (Patrik Elias, Travis Zajac, Adam Henrique) and new faces (Ryane Clowe, Michael Ryder) will attempt to score just enough goals to allow Brodeur or Schneider to carry them to wins. Given the strength of the division, it could be arduous season. I’ll miss watching Kovalchuk. He was a magician with the puck. His shot could splinter goalies’ sticks. The glaring gaffe or flub would be followed by moments of sheer artistry or clutch offense. For years, Devils fans would learn to appreciate the feats of players like Brodeur, Stevens and Niedermayer; never before was there an offensive player who, frankly, was worth the price of admission. Kovalchuk came close. But in the end, this is still the franchise of Brodeur and Stevens and Niedermayer and Daneyko and Driver and Rafalski. It’s defense over offense, team over individual. Above all else: It’s players who proudly wear the logo on the front. That want to be Devils. Kovalchuk didn’t, as much as he wanted to be Russian Hockey Czar. So, do svidaniya comrade. Enjoy the Rubles.